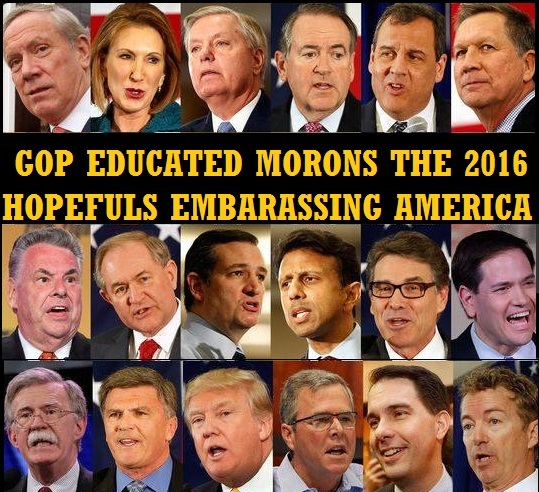 Fox News Your Television For The Haters Liars Crooks Bigots Racists Welcomes The Republican 2016 Hopefuls On August 6, 2015 To Their First Debate. Too Many Clowns In The Political Run-Away-Clown-Train Some Had To Be Cut. What A Shame! [Washington Post] The last few national polls are trickling in, finalizing which Republicans are in and which are out for this week’s first 2016 debate in Cleveland. It’s only the ten with the highest polling averages, remember, meaning that John Kasich’s well-timed announcement bump has displaced Rick Perry, whose attempt to pick a fight with Donald Trump very much did not work. With the new NBC News/Wall Street Journal poll, the stage likely looks like this. 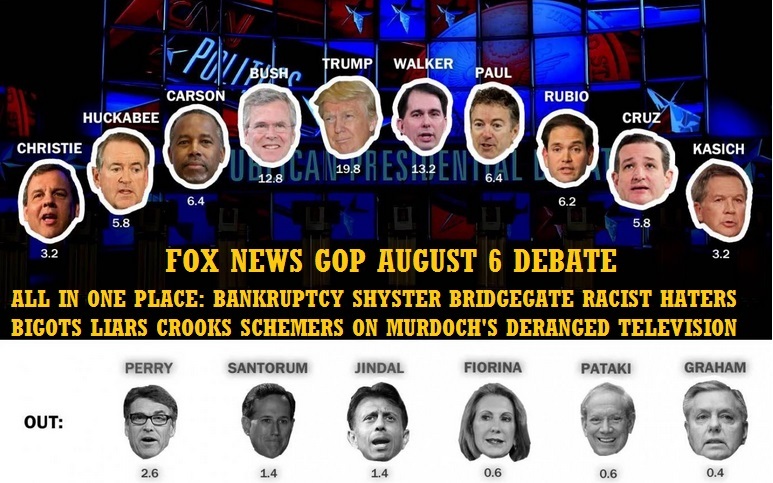 The biggest change in this new graphic is that Jeb Bush is no longer in the top two, for the first time since we started compiling these graphics in late May. That is what political pundits call a “bad sign” — but one probably shouldn’t read too much into it, just yet. We don’t know how many more polls are waiting in the wings this week; it seems safe to assume that pollsters will be looking to capitalize on the big splash that each new poll will bring. But it is very unlikely we’ll see many dramatic changes to the stage as it appears above. But then, in this election cycle, you never know.